y(x,t) = A sin (kx + ωt + δ). y(x,t) = A sin (k (x + (ω/k)t)). y(x,t) = A sin (kx - ωt). We say that a traveling wave propagates through the medium. Sound is a longitudinal wave: the wave function describes changes in air pressure which are parallel to the direction the wave is traveling. Water waves, seismic waves and light waves are all transverse: the displacement of the water, ground or electric and magnetic fields are all perpendicular to the direction the wave is traveling. The foremost edge of a traveling wave is called the wave front, and plays an important role in our understanding of wave behavior. Each oscillator generates a hemispherical wave disturbance in the direction of travel, which we have shown here in cross section as semicircles. The wave front is tangent to the semicircles at any given time. I = P / (4 π r2). From this we can see that while the total energy in the wave is constant (ignoring dissipative effects), the intensity drops off as 1 / r2. We see that the angle of reflection is equal to the angle of the incident rays. n = 2.42 in diamond. Note that for any angle greater than the "critical angle"
Snell's Law is not applicable; instead of refraction, there is total internal reflection, which means that the ray (and hence the wave) does not cross the boundary. and finally the ray is refracted as it exits the eye's lens and enters the vitreous humour. The depth, shape and index of refraction of each medium determines the degree to which the rays of light are bent, and hence the focal point: where the image is in focus. The focal point should be just short of the retinal surface; if it is too close to the eye's lens, the eye is near-sighted and requires a divergent, defocusing corrective lens; if it is on the retinal surface, the world appears as a bright point of light; and if it is behind the retinal surface, the eye is far-sighted and requires a convergent, focusing corrective lens. Careful application of Snell's Law will enable you to determine whether concave or convex lenses are focusing or defocusing. Recall the wave demonstration applet in the previous section. Set the black and blue waves to the same mode number and observe the red superposition wave as you vary the blue wave phase angle. When the phase angle is zero, the black and blue waves are said to be in phase and constructively interfere. When the phase angle is π or -π, the superposition wave has an amplitude of zero and the black and blue waves are said to be out of phase: they destructively interfere. The interference of coherent waves (which start out in phase) lies at the heart of the quintessential wave phenomenon: diffraction. x = a L λ / d.
For constant wavelength, an increase in d moves the maxima closer together (the angle must decrease for a given m) and washes the pattern out. For a constant slit separation, increasing the wavelength spreads the pattern into a continuum (the angle must increase for a given m). In the limiting case, if d is less than λ, the condition for secondary maxima (m > 0) cannot be met. This illustrates the fact that resolution is limited by wavelength: you cannot distinguish two objects which are separated by less than one wavelength of the wave being used to image them. 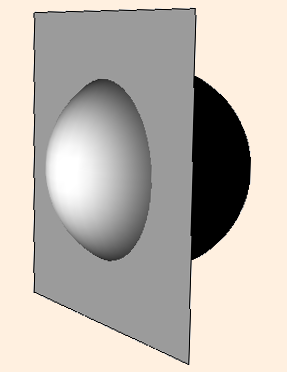 For a convex mirror (looking into the outside of the spherical segment), the magnification of the image (the ratio of the image size to the object size) is equal to 1 when the object touches the mirror, and reduces to 0 as the object recedes to infinity; and the image is always "right-side-up". As the object continues to recede, the image is inverted (M < 0), and slowly shrinks in magnification. Try this with the inside of a highly polished serving spoon, or some other reflecting concave surface. Here, as an object approaches r=2M, a far-away observer sees any change in position as taking infinitely long: the inward-falling object never appears to gets closer than 2M, even though the object itself has long since crossed that boundary. We will discuss this issue in more detail later (note that to simplify the equation, we have changed the units of M to meters by multiplying the mass by G/c2, where c is the speed of light). The next section introduces the magnetic field.